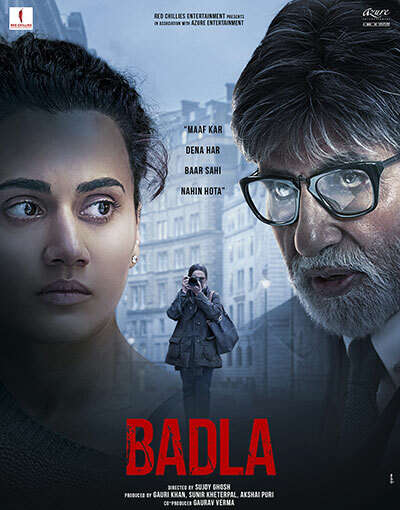 "Badla” Starring Amitabh Bachchan, Taapsee Pannu, Amrita Singh, Tony Luke, Manav Kaul, Denzil Smith; directed by Sujoy Ghosh; music by Anupam Roy, Clinton Cerejo, Amaal Mallik. Becoming skilled at the genre, the director of “Kahaani,” Sujoy Ghosh, helms this thriller, an official adaptation of the Spanish mystery “Contratiempo” (The Invisible Guest). Last seen together in “Pink,” Amitabh Bachchan stars as high-profile lawyer Badal Gupta and Taapsee Pannu plays Naina, a businesswoman accused of murder. The captivating trailer reveals she was married but recently involved with the victim and claims she didn’t do it. Gupta wonders, is he actually seeing what happened or only what Naina wants to show? That is the question. Malayalam actor Tony Luke makes his Hindi debut. Expectations are high for this stylish revenge crime drama with a stellar cast and story. The film was shot on location in Glasgow, Scotland. Shah Rukh Khan’s Red Chillies Entertainment is co-producer. “Kesari” Starring Akshay Kumar, Parineeti Chopra, Bhagyashree; directed by Anurag Singh; music by Tanishk Bagchi, Arko Mukherjee and others. This historical drama tells the incredible story of the 1987 Battle of Saragarhi when 21 Sikh soldiers in the British Indian Army fought over 10,000 Afghan tribesmen. After warnings that attackers were coming, the soldiers called for help from their signaling post between two forts and were commanded to hold their post. The brave men fought waves of invaders for six hours without aid from British command. 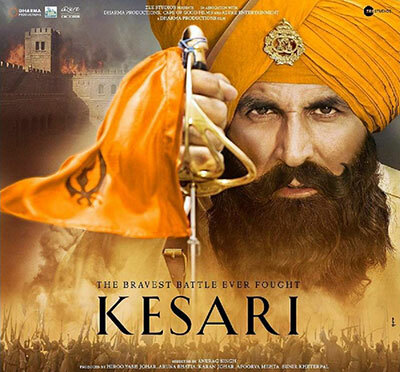 Akshay Kumar stars as Havildar Ishar Singh, the leader of the 21 men regiment. Even when they know help will not arrive in time, the Sikh men honor their duty. After several soldiers succumb, the invaders offer wealth and safety to abandon post, the men refuse. They fight as long as possible giving the British time to secure the forts. The story is shown on an epic scale and Akshay Kumar is sure to deliver on the action. Parineeti Chopra is featured in a pivotal role and Karan Johar is producer.